Based on a particular hue from a UK coastline plant, blooming in late Spring, Katrina Moorhead has ensembled an exhibition at Inman Gallery entitled seapinksea (on view through April 27, 2019). A stocky perennial native to the UK coastline, Moorhead’s memory of this particular flower serves as the life line throughout the exhibition. Despite the color name of this show, this particular shade only appears once in the watercolor of this specific plant worked as a digital print and embossed with dark black tendrils of sea salt within the installation with the same title as the exhibition. The isolation of this piece in medium, color, and style, does make a statement about the warm nostalgic aspect of her artistic assemblage that often speaks more on the emotional landscape level versus the aesthetic language. The show’s variety, especially in the front room, could be mistaken as a group show due to the variations in pieces, none in direct correlation to each other. Yet you do notice that nothing is placed by mistake, each piece allows for pausing then changing before moving to the next and as the artist said, there is a certain amount of fattening of the air that happens in between the spaces. But in contrast, the back room that holds the pink flower centerpiece contains a minimal installation of wood that encompasses the room like a railroad track with various inlays such as plants and tambourine cymbals which seem to exist as debris from someone’s memory but extracted by Moorhead to be hauntingly honored within her installation. Going back to the front room, one comes to the hanging framed piece featuring a drawing of stones in resemblance to those revealed by the water, specifically those in the Czech Republic. In unknown stones, the sereneness and subtle hand honors the natural and the meditative state of water in nature. 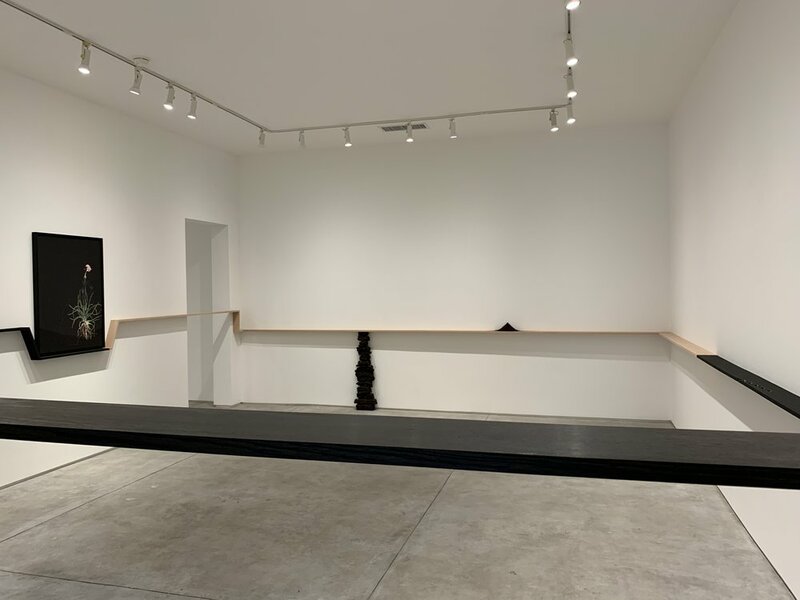 Stemming from this in front of the framed work is another installation untitled: suspended in flight from the ceiling, drooping down to the near center of the gallery is a hanging piece of Japanese paper folded over the thin black rope. The use of Japanese paper allows for one to see the back of the drawing and the bleed through of subtle colors. Moorhead noted that the piece came to her in thought, especially the hanging of the work. It was an homage to her thought of a peacock in flight with the under feathers revealing the true colors underneath. Crossing over visually on the other side of the room stands a large totem complied of organic shapes, glitter, and feathers in a combination of confused but configuratively set nature. The piece tree full of love was actually taken from a drawing from Moorhead’s daughter, born to self consciousness from her mother’s hand. She remembers her daughter frantically working on this drawing, executing each element like a survivor plan with specific parts of strength, functionality, and fantasy. Then there was the important elements of the spark of the initial idea, the speed she drew each portion, and the beaming pride when her design was finished. Moorhead took this opportunity to try her recreation of capturing the same threads of spirit from daughter to mother. The connection between imaginative and emotional content is felt and freed within the form. One of the landing points of the exhibition is an all white flower sculpture long playing record. This piece, which comes from the inspiration of the original arrangement within a painting by French painter Henri Fatin-Latour that hangs in London’s National Gallery, was featured as album art for New Order’s Power, Corruption and Lies. Moorhead’s distinct recollection of this cover tied to her youth has been meticulously recreated through 3D printing, reflecting the exact capture from the famous album. Between the multiple reworks in Moorhead’s mind, she makes a ethereal connection to time and chronologically nodding to various forms of history but covering the same object. The result is a distortion within the subject but a pristineness of presentation, just like the haziness within a memory of when you first heard a specific album but a clarity within the sounds and lyrics when they engulf you again. Overall, the connecting surges and waves between the work are through the subtle emotional content. There is also a tension to touch the objects, especially the glimmer of the tambourine cymbals and the textures of the paper and feathers. WIth this it truly reveals that materials can nod to an emotion, feel intentional and not decorative despite their usual use. Knowing the background of the show, you are aware of the artist’s sentimental connections to the pieces yet a viewer’s interpretation is still allowed room to breath, attaching a conceptual hum within emotional landscape with the work. With this, it is an exhibition where longer time spent within the work does offer a chance to absorb the feelings Moorhead intentionally or unintentionally offers for encounters with her pieces.